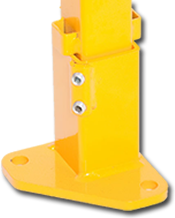 Our Machine Guarding is a 100% power-coated steel product, consisting of a modular system of posts, panels, and gates that protect automated machinery and the people who operate it. Our machine guarding comes in four different post heights, six styles of gates (doors) and over 40 pre-fabricated panels in various sizes and configurations. Our guarding helps you meet OSHA, Canadian (CSA) and European (EN953) safety regulations. AGS is unique in that we are the manufacturer and not a reseller of all of our guarding products, therefore we can provide clients with custom solutions based on their unique needs. If necessary we can offer clients complete engineering services to help with setup of their guarding. Call us at 1-877-753-3381 or email us at sales@ags.us.com for questions regarding your specific perimeter guarding needs. Panels come in widths from 300mm to 3000mm wide, and heights of 1400mm to 2300mm. Each Panel can consist be setup with any combination of our mesh and and weld screen products. Steel Mesh (2x2 or 1x1) with Weld Screen.